The Bahá’í community of Saint Paul, Minnesota began in 1909 when Dr. Clement Woolson, who became a Bahá’í in New York City in 1899, moved to Saint Paul to establish a Bahá’í community here. Both Clement and his wife Leona were osteopathic doctors and active Bahá’ís. The Woolsons held weekly Bahá’í gatherings in their home in Saint Paul. They were early contributors to the Bahá’í Temple Unity, a fundraising committee destined to build the first Bahá’í temple on the North American continent. The committee had been established in Chicago in March of 1909 on the very same day the remains of the Bab , prophet-founder of the Babí religion and forerunner of Bahá’u’llah, were laid to rest by Abdu’l-Bahá in the specially erected mausoleum on Mt. Carmel in Haifa, Israel. In 1912 Clement was a delegate to the 4th Bahá’í National Convention in Chicago and Leona was the alternate delegate representing the Bahá’ís of Saint Paul. At the end of the convention, on May 1st, 1912, they were able to attend the large gathering in Wilmette, Illinois when Abdu’l-Bahá, son of the prophet-founder Bahá’íu’llah, laid the cornerstone for the House of Worship. Come September 20th, 1912, Abdu’l-Bahá spoke in the Woolson home on spiritual education. A Saint Paul newspaper announcing this talk said the Woolsons were expecting a diverse group of guests including members of the Saint Paul Theosophical Society. Abdu’l-Bahá spoke to other Theosophical groups in other cities during his 239 day tour of America and Canada. He had commented that Theosophists were more open to new spiritual ideas, and that Americans in general were more open than Europeans. One of the principles of the Bahá’í Faith is independent search after truth as opposed to blind acceptance of what others might say. Resulting from the captivating talk by Abdu’l-Bahá in the Woolson home and Dr. Clement Woolson’s beautiful, inspired and explanatory talks with his gift of eloquence and excellent diction there were soon others declaring their faith in Bahá’íu’llah. By 1922 there were nine Bahá’ís in Saint Paul, the number required to form a Local Spiritual Assembly (LSA). However, it was not until 1923 that Shoghi Effendi, Guardian of the Bahá’í Faith and great-grandson of the prophet-founder Bahá’íu’llah, called for the election of the first Local Spiritual Assemblies. The National Spiritual Assembly of the United States did not establish official LSA election forms or publish an LSA directory until 1925. Thus there are no official lists of assemblies before 1925. In 1925 the Saint Paul Bahá’í community did not elect an assembly suggesting that some members had moved away reducing the community to less than nine. It took until 1931 to reestablish the Saint Paul Local Spiritual Assembly. Among those attending the gatherings at the Woolsons were the Abas, Kadrie and Hider families. 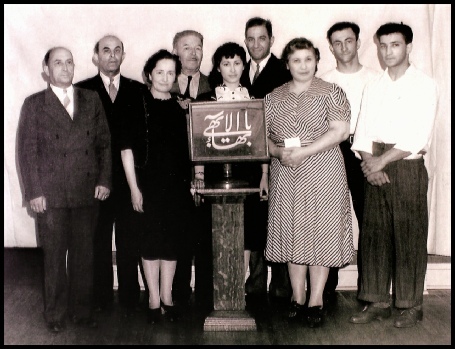 These three families from Syria moved to New York in 1902 and on to Saint Paul in 1922. First Hassen Abas attended the gatherings and soon after Alex Kadrie and Kamel Hider were attending talks at the Woolson home. By 1930 or soon after all three had become Baha'is on fire with the Cause of Baha’u’llah. These were large families; Hassen Abas and his wife Madie had nine children of their own. Their daughter Gayle Abas accepted the Baha'i Faith in 1932 at the age of 19. Three years later, after Dr. Woolson’s his first wife Leona died, Gayle Abas married Clement. Dr. Woolson passed away a few months later. In 1941 the Local Assembly filed incorporation papers with the State of Minnesota and it has been an active and vibrant community ever since. A number of members from the Saint Paul Baha'i community have moved on to travel teach, open new territories or volunteer to work at the National and World centers or at various permanent Baha'i schools. Gayle Woolson went on to open the Galapagos Islands to the Baha'i Faith in 1954 where she earned the distinction of Knight of Baha’u’llah. In 1971 she authored the book, Divine Symphony, about world religions and their oneness. Then in 1976 she wrote a biography about the Abas, Kadrie and Hider families. The Clement Woolson home in Saint Paul was placed on the International Registry of Baha'i Holy Places and Historic Sites in 1974 because of Abdu’l-Baha’s visit and talk there on September 20th, 1912.